Of interest to historians and collectors, historical political cartoons depict the events of history using satire and humor as a way of swaying the opinion of viewers. Political cartoons, also known as editorial cartoons, are a unique art form. In addition to satirical humor, artists' use a combination of caricature drawing, visual metaphors and allusion to convey a political message with a definitive slant. The job of the political cartoonist is to use his skill to appeal to the people and influence their view of a political event. Although European historical cartoons with a political purpose date back as far as the 1400s, they did not become a popular form of art until the 1700s in England. It was the cartoons of William Hogarth, often referred to as the grandfather of satire, and James Gillray, a renowned caricaturist, that contributed to the popularity of political cartoons. For more than two and a half centuries historical political cartoons have appeared in publications in America. On May 9, 1754, the first one, drawn by Benjamin Franklin was printed in The Pennsylvania Gazette. Benjamin Franklin also owned the newspaper. The cartoon, picturing a snake cut into eight pieces, was called Join or Die. Along with the political cartoon Benjamin Franklin wrote about the eight British colonies and their disunited state. One of the first things a collector of political cartoons must decide is whether or not to limit their collection by a set of specific criteria or if they want their collection to be general in nature collecting any cartoon that they enjoy. For example, some collectors might decide to only collect historical cartoons of the Civil War, presidential elections or World War II. Others may limit their collections to historical cartoons that relate to a specific person such as Abraham Lincoln, William Boss Tweed or John F. Kennedy. Still others may want their collections limited to cartoons by a specific political cartoonist such as Thomas Nast, Herbert Block or Clifford Berryman. Political cartoon collections can also be determined by an era or the events that took place over a certain span of years. If you are a new collector of antique or vintage political cartoons or want to add to an existing collection, there are many places to find these paper treasures. Ephemera auctions often include political cartoon collections. These auctions take place online at websites including eBay and Luckners. 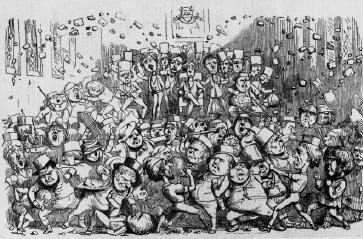 Heritage Auction Galleries, the world's largest auctioneer of collectibles and the world's third largest auction house, often includes political cartoons in their auctions. Estate, tag and rummage sales may have boxes full of old political magazines or newspaper that may contain political cartoons. Whether you are a collector of political cartoons or simply enjoy seeing the events of history from a different perspective, the following links provide a look at a sampling of these antique collectibles. A collection of political cartoons of Herbert Block, known as Herblock from the Washington Post. Herbert Block's cartoons range from Great Depression to the new millennium. Historical political cartoons offer viewers a different way of perceiving events of the past.